Politicians must choose to either stand up for what they believe or maximise their vote. To put it bluntly: they either lie or they lose. Few expect politicians to tell the truth and few are particularly surprised or affected when lies are exposed. Why is this the universal experience of politics in most developed democracies? It turns out the answer is related to ice cream. Imagine you’re looking to set up an ice cream stall on a beach. There is already one ice cream stall on this beach and, sensibly, they have set up right in the middle (Figure 1). 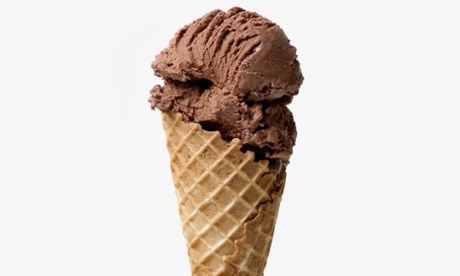 Where is the best place to set up your new ice-cream stall? Most people’s intuitive answer is to suggest setting up at either A or B in Figure 2. 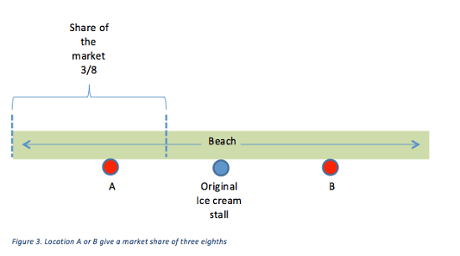 Assuming both stalls sell the same thing for the same price and people will simply buy from the closest stall, if you select location A or B, your share of the market will be 3/8, as illustrated in Figure 3. However, if you set up as close to the existing stall as possible, your share of the market will be very close to one half (Figure 4). This is in fact a classic example used in undergraduate economics textbooks illustrating the process for deciding the optimal location for a new retail outlet. But it’s also a perfect analogy for modern democratic politics if we substitute the beach for some measure of political spectrum such as left/right or authoritarian/libertarian. When we plot this for US presidential elections, what happens? 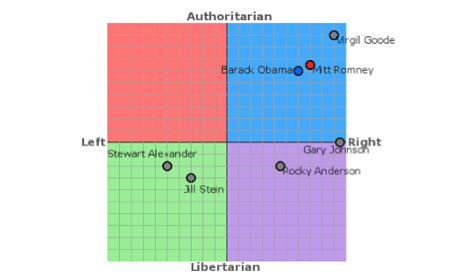 Political Compass graph of the 2012 presidential elections. I’m using graphs from Political Compass for this comparison but it doesn’t really matter which measures of political orientation you use you get similar results. See where Barack Obama and Mitt Romney are? It’s just like the two ice cream stalls on the beach. How about the Australian federal election in 2013? The two major contenders, Labor and the Liberal/National coalition, sit almost as disturbingly close on the graph as the Democrat and Republican presidential candidates. The UK is barely different. Most politicians enter politics for ideological reasons. They want to contribute and make the country a better place (by whatever measures they see as important). However, the primary game of politics in a democracy is one of vote winning. You can’t implement your policies if you’re not elected and once elected the most important thing is to be re-elected so that you can continue your work improving the country. As a result, many politicians make this Faustian bargain; they sell their soul in order to prolong their political careers. They know that the best place to set up their ice cream stall is right beside their political opponent, with just enough differences to identify them with the one side or other of the spectrum. They face the choice of openly and honestly standing up for what they believe or maximising their vote. To put it bluntly, they either lie or they lose. The federal election of 2013 in my home country of Australia was a perfect example of this new era of political strategy. During this election campaign there was an unprecedented proliferation of fact checking units and web sites monitoring and reporting on the validity of politicians’ claims. The rate at which these fact checkers were pouring out verdicts indicating that politicians of both major parties were lying and exaggerating their way through the campaign was remarkable. Even more remarkable was how many of the false statements continued to be repeated after they were exposed. Now that the Coalition are in government the lies haven’t stopped. In fact, I think it’s reasonable to conclude that the coalition government are using lies and exaggeration to justify the overwhelming majority of their agenda in which they are breaking many popular pre-election promises. So, we know The Australian government lied its way into power. We know the now Labor opposition tried to lie their way into keeping power. We know that the government is lying in order to cover up its real policy agenda. Yet, knowing all of this changes nothing. This contempt for voters and for democracy more generally is a predictable product of the conflicting pressures politicians face. This framework for thinking about political strategy gets sophisticated enough to explain the rise of the tea party (in various forms in many countries) when we add two more considerations: preselection – or primaries as they’re known in the US; and campaign funding. Preselection is the process whereby the parties select their candidates to run in elections. In the US, let’s imagine the values of voters along a particular political spectrum are as shown in Figure 8. When running in primaries, the same driving forces are going to apply as above. The most effective strategy for Republican candidates will be to cluster around the red dot. However, the red dot is a long way from the centre of the spectrum where that candidate will need to place themselves in order to compete against their opposition Democrat candidate in the election. Thus the well-known phenomenon of primary candidates espousing extreme views, with the winning candidate having to frantically tack back to the centre once they are the only one left standing. The tea party represents the backfiring of this strategy, where grassroots members are preselecting candidates who aren’t interested in moving back to the centre. The distance from the middle of the political spectrum leaves many tea party candidates unelectable outside of religious conservative stronghold electorates and absolutely unelectable as president even though they may one day win primaries. However, their very presence in elections allows their opponents to shift further to the right without penalty, thus potentially shifting the entire politics of the country in that direction. The Republican Party may lose, but democracy may lose even more as a growing number of people find themselves without candidates who represent their views. This backlash is not limited to the US. The rise of ultra-right politics in Europe and the rise of the Greens in Australia and elsewhere are largely a result of the same phenomenon. 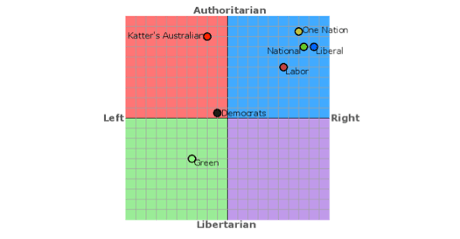 Major parties positioning themselves side by side on the political spectrum opens up a lot of territory for other parties to move into. However, for Australia at least, preferential voting systems will see the majority of votes ultimately returning to the parties in the centre, making the strategy sustainable. 1) Exaggerate or lie about the record of the government they were trying to replace. 2) Make promises to the electorate they knew they wouldn’t keep (given the evidence of the Budget). 3) Make promises to corporate donors they intended to keep. 4) Excuse breaking the promises to the electorate by inventing a budget and debt crisis. These strategies have allowed them to appear to be all things to all people while actually delivering to their corporate backers. The reality is that it’s much harder to justify to a corporate donor why you haven’t given them value for money than it is to a voter as to why you haven’t done what you said you were going to do. In a system where all the major contenders stretch the truth, lying isn’t that much of an electoral liability. This model for thinking about political power in our democracies is far from complete. Social structures and organisations as well as solidarity among elites also play a huge role. However, what is presented here is enough to explain why politicians lie and why, in many instances they have no choice but to do so. The honest ones are highly unlikely to succeed in forming government. This entry was posted in Australian politics, Political philosophy and tagged government, political theory, politics, The Guardian. Bookmark the permalink.